Harry Potter was one of the most popular Humanities offerings of 2018, with nearly 400 students enrolling. Photo by Carolyn Lagattuta. Take heart, young muggles. The fictional Hogwarts School of Witchcraft and Wizardry of Harry Potter lore will never send you a letter of acceptance. But perhaps if you’re lucky, you will grow up and attend a school as magical as UC Santa Cruz, which offers a class on Harry Potter. Renee Fox, an assistant professor of literature, and co-director of the Dickens Project at UC Santa Cruz, was not quite sure what to expect when she offered the class for the first time this winter. But the course, officially known as LIT 80Y: Harry Potter, was such a rousing success that Fox now plans to bring it back in the near future. In fact, Harry Potter was one of the most popular Humanities offerings of 2018, with nearly 400 students enrolling. The class had been in the works for a while. “Whenever I’ve just taught one of the Harry Potter books, I’ve desperately wanted to have time to teach more of them, so I finally suggested that I teach a class devoted to the whole series,” said Fox, who specializes in Victorian literature. Fox, after all, is a committed “Potterhead.” Like other fans of J.K. Rowling’s series, she’s visited the Pottermore website to take its personality quiz to be “sorted” into a Hogwarts house, one of the schools’ four dormitories: Gryffindor, Hufflepuff, Ravenclaw, or Slytherin. She also knows the shape of her “patronus spell”—the wizarding version of a spirit animal. More importantly, Fox has read the series many times, and has assigned Harry Potter books in courses on gothic and monster literature. The class reading list was ambitious: students had to read all seven books, though they were allowed to see the movie version of the fifth book during midterms if they were pressed for time. Each week the course covered a book in the series. Instead of inviting a simple, straightforward reading of these popular books, Fox had her students use each volume as a means to discuss literary theory. Students used complex textual analysis to examine the book in a new light. 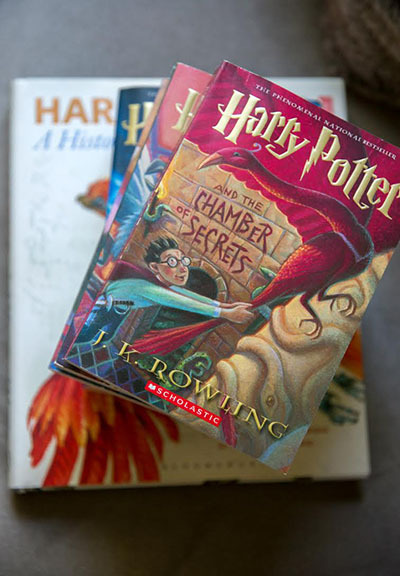 For example, the first book was a jumping off point for “genre studies.” Students examined the book, seeking out the traits that make the Harry Potter series fall into the realm of children’s literature. While reading the second book, students learn about psychoanalysis and the role of developmental stages on the characters. Students even take a look at animal studies to understand the significance of a wizard’s ability to take the shape of animals in the third novel. But it’s one thing to plow through these books as a fan, and another to revisit them in an academic setting, a process that helped students uncover more than they did as children reading the book for entertainment. For the first assignment, students wrote about the experience of reading the books as adults. Some students wrote about how the books raise interesting questions about identity, since wizards can change their appearance or even become invisible. The poor treatment of house elves and muggle-borns in the wizarding world prompted discussions of gender, race, and class. Fox taught students to take a methodical, deliberate look at the novels. “When you look closely at the very first pages of each novel, you learn huge amounts about the thematic preoccupations, politics, prejudices, and questions that will unfold over the rest of the novel that follows,” Fox said. The course brought some of the charming aspects of the novels to life. Like their counterparts at Hogwarts, students in the course got assigned to one of the schools’ houses based on their section time and teaching assistant. Representatives from Gryffindor, Hufflepuff, Ravenclaw, and Slytherin would tackle an interpretive question and earn points for their house. The house with the most points at the end of the quarter received extra credit in the course. Fox hopes students have left the course with an appreciation for how smart the books are, and how complexly they navigate questions of identity, power, race, class, and political systems. She hopes that students will have a better understanding of what literary analysis is, and how its approach to the novels would be different from the approach of an ethics or religion course. Students enjoyed the course, which many said met their high expectations. For Thais Hogart (Rachel Carson ‘18, literature), the course was a highlight of the year. Hogart’s father used to give her a hard time for rereading the Harry Potter books so often, because he thought the books were for children. This course validated Hogart: if there is enough substance in the novels for a whole college course, it’s worth the many reads.